As spotted by Twitter user Ashley Renae, Titan Publishing’s official Infinity War magazine is reportedly carrying an interview with Ms. Pepper Potts herself in which she reveals… she has a kid?! Wait, what? Yup, there it is. Clear as day. How, if this is accurate (and there’s no reason why it wouldn’t be), it got through several layers of editors, checkers, and proofreaders and Disney and Marvel Studios I have no idea. I can’t even make a terrible joke on here without someone tutting and shaking their head in disgust. 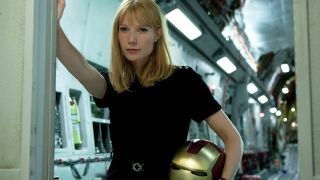 If Pepper Potts is with child (something she mentioned she wanted at the onset of Avengers: Infinity War), that could open up a whole new avenue of storytelling for Tony Stark in the MCU – if he survives Avengers 4. The lovey-dovey ending would be by pick: have Tony retire with his new family to pave the way for another generation. Taking inspiration from the comics, though, may give us another move entirely. Meet Howard Stark II. Son of Tony and Pepper Potts, he makes his debut in Invincible Iron Man issue 500 and… almost immediately dies alongside his father. Sob. Ok, ok some context: it’s a flashforward 40 years into the future which shows Tony and Howard fight off the Mandarin one last time before perishing. While that is never going to happen in the MCU, it’s clear that the path for Tony to pass the iron baton onto his own offspring has been mapped out in the comics already. Pepper may have a hidden bun in the oven but we're still not over everything that needs to be discussed with the Infinity War ending.